This is my official December 2016 Net Worth Update. 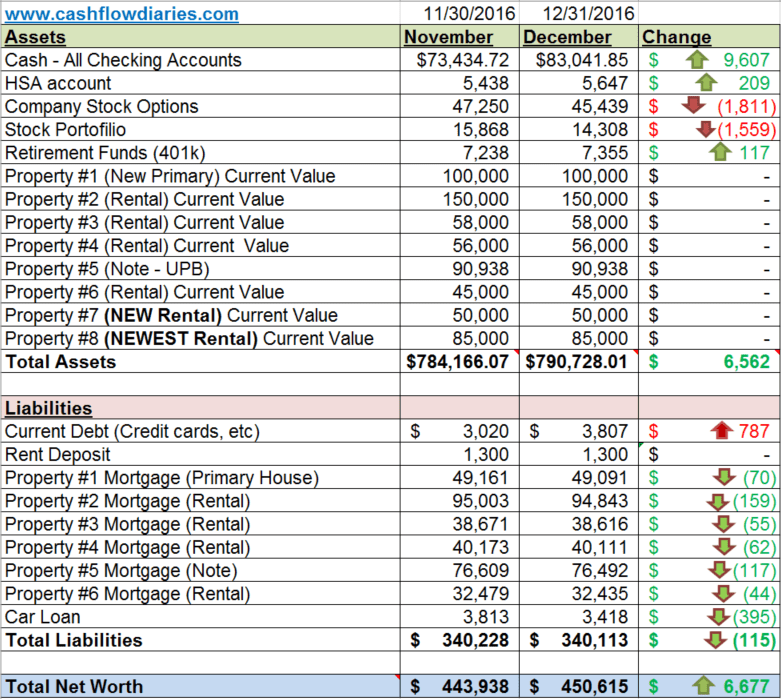 Below are my actual numbers for ALL my investments and liabilities as of 12/31/2016. Detailed explanations and a quick summary can be found below. If you would like to see my previous months net worth posts, please visit my Net Worth Tracker. I have been tracking my net worth monthly since May 2015. If you want to learn how to track your net worth then check out how I am doing it. Wow what a year!! Happy New Years to anyone reading this. 2016 is going to go down as one of the best years I have ever had. So many accomplishments that I am proud. December is now over which means the holidays are over. In a way I am glad because I spent way too much money during the holidays. 😉 With all the travelling we have done in December which you will read about below and all the xmas gifts for the kiddos in our family, it really put a dent in my pocket. Fortunately my net worth still went up which is amazing. Now that we are in 2017, I can concentrate on building my finances to another level. A whole ‘nother level!! 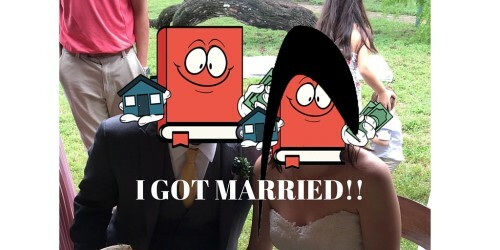 I got married!! This one was the big one for me. I married the love of my life and our love continues to grow stronger by the minute. I couldn’t have asked for a better wife. I bought 2 more rental properties. My portfolio is now up to 7 investment properties and my cash flow continues to increase. I increased my net worth in 2016 by $105k. I changed my whole life around, cut bills and live a much less stressful life by moving to Indianapolis from Austin. I traveled all through out the United States and even went to Costa Rica for my honeymoon. As you might be able to tell, I LOVE TRAVELLING! For 2017, I want to continue this trend of personal, emotional and financial growth. I truly hope I can keep this up. I want to buy at least 2 more rental properties and continue travelling with my wife. My wife and I have also decided that 2017 will be the year we try to start having babies!! Can’t imagine what my future looks like but I am sure it will be great! Personal Life Update – My wife and I went on a two and half week vacation/road trip in December for the Holidays. We drove from Indianapolis to Memphis, Memphis to Tyler, TX, Tyler to Austin, Austin to Houston. Then on the way back up we did Houston to Little Rock, Little Rock to Nashville and finally Nashville back to Indy. We stopped in each of those locations and had a chance to explore and experience each city during our road trip. We partied in Nashville for the New Year’s celebration and enjoyed every second of it. Nashville is a super cool city. We just got back to Indy actually and life will all go back to normal now. Which is a good thing! It’s not easy hitting the road for so long and not having the comfort of your own bed. Anyhow, we are now in full-blown winter here in Indianapolis but the temperature is only in the 40s today which is not bad at all. It’s supposed to dip into the 20s later this week though. For those of you wondering, we have still not really been affected by the “cold” winters here in Indy and everything is still going great. We had a few single digit temps before we took off on vacation but it wasn’t the bone chilling cold I thought it would be. Grant it we weren’t just hanging outside for long periods of time either. We still love living here and we think 2017 is going to get even better for us. I want to buy at least 2 more rental properties in 2017. Amazon FBA Update – December came on strong with the Amazon sales and for the first few weeks I was selling anywhere from 10 to 20 units a day, most days closer to the 20 mark. It was amazing and it felt really good. This was a huge increase as I was only averaging about 5 sales a day before this. Well this was all great and the money was rolling in UNTIL….. AMAZON DESTROYED ME!!! Amazon decided to deactivate my listing due to a fraud concern. I received an automated email indicating there was a complaint on my listing for fraud. It made zero sense to me and it took me almost a week just to clear it up. Once that was cleared up, Amazon still would not let me activate my listing but now for a different reason that I am not approved to sell in the category that they moved my product to. And they won’t move my product to a different category. As of right now, my listing is still inactive and I am unable to sell my product on Amazon. I will spend the next few weeks trying to figure out the best course of action and how to get my listing active again. The good news though is that I only have 218 units left to sell out of the original 1000. At the rate I was selling in December, I would have cleared out all my inventory before Christmas. Anyhow, I will be working on trying to fix this so that I can finish selling my remaining inventory. I will write a more detailed post with numbers and a more in-depth explanation of how and why this all happened in a future post so stay tuned. My cash position continues to increase despite all the spending I am doing which is great. I know I spent thousands in December for travelling and christmas gifts so I love that my cash still increased. This of course is all because of my amazon business. The majority of that cash was payments from Amazon for all the units I sold in the first half of December. I’m also expecting a big chunk of this cash to be used for paying taxes later this year. I plan on owing a lot of money in taxes this year. Back in November I sold a bunch of my stock options because they hit my sell mark however I did not sell them all . I really just do not need the cash right now so I would rather keep the remaining stock options to see where it goes. Unfortunately as of today, the price has fallen a bit and is now back below my initial “sell mark”. Oh well!! The majority of my stock portfolio is built of precious metal mining stocks. Overall I am still up on my stock but it has been going down for a while now. I’m not worried about it at all though, I’m just planning on riding it out. I think 2017 will be a good year for these stocks. Just have to wait and see. Overall I am still profiting from these stocks as I bought them for dirt cheap. Rent paid on time, no repairs requests. This is the property I self manage in Austin. Even now that I live in Indy, I will continue self managing this one. I think I can do it from afar and if in the future I realize that I can not continue being my own property manager, then I will probably just find a PM to handle it. So far everything is going great. I have not heard a peep out of them and they locked in for a 2 year lease so I’m hoping this one is a cash cow for a long time. This is my newest rental. I bought it from a wholesaler here in Indy for $65k in a very popular Indy neighborhood just a few months ago. I finished the rehab on this one in late November/early December and got it rented out for $950 just in time for christmas. December is not easy to find a qualified tenant. Not only did my property manager find a qualified tenant but the tenant signed an 18 month lease so that we both don’t have to deal with a vacancy/move in December again. Talk about a Christmas miracle!!! Glad to see you back and see your net growth go up an astounding amount considering you were still traveling and enjoying yourself. Love following your journey as I would like to get into real estate one day! Keep the articles coming! Great job! Way to be intentional about your goals and using your blog to hold yourself accountable! Keep up the good work! The blog was probably one of the best things I have done as far as keeping me accountable for my goals. It helps a ton! Sounds like a great month of family and traveling! Damn sorry to hear bout the amazon hiccup. Sounds like things were rolling along. 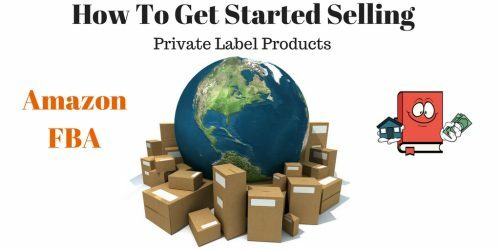 Will this keep you from future private label products or a common bump in the road? Happy New Year! Hey Brian! Yeah the amazon hiccup was painful to me. I think I will make my final decision on if I will proceed with the Amazon Business after I sell out all my inventory and add up my returns/ROI? But right now I am leaning that I will not continue this venture. Thanks for sharing! Sorry to hear about the Amazon issue. I had considered doing Amazon FBA but heard about the same issues you are dealing with so I think I will try something else. On your rentals, are you seeing much appreciation on your Indy properties? I have 14 units in the Seattle are and just bought a duplex in Greenwood, Indiana and the cash flow is fantastic I’m just not sure about what kind of appreciation to expect. Hi Jennifer! Yeah the Amazon thing has potential but there are a lot of deal killers as well with it especially if you are only relying on Amazon for sales. You know I actually have some appreciation on some of my rentals in Indy but only the ones that are super close to downtown in the bates hendricks neighborhood. My other ones havent seen much appreciation although I do have one in Irvington that might have had a bump. On my next net worth post, I am planning on re-assessing all my properties so you will see for sure which ones have appreciated. Congrats on your new duplex in Greenwood! I probably wouldnt anticipate much appreciation out there but I think you will definitely have at least some. Greenwood is nice. Hey Jef! Yeah travelling has taken up a lot of my time and I have not had much time at all to concentrate on writing blog posts. Thanks man!! The Amazon situation is exactly why it’s a great idea to diversify your income sources, especially if you’re relying on any specific platform. You never know whether something like this might happen. Hope that all gets sorted out! Definitely, i dont think it would be smart at all to rely solely on amazon. Amazon can be so difficult. I bet they either (a) started producing a similar product themselves or (b) were contacted by your manufacturer, who decided to disregard your patent and sell to them directly. It’s hard because as a customer, I love Amazon – convenient, reasonably priced, secure. But I hate how unfriendly they are becoming to business. (website is hubby’s ventures, not mine, but thought I’d link since he’s had some similar experiences). * hubby’s website is FullLifeShift (not Fastlane Forum). CommentLuv makes it look like I’m the one who recently posted to it, but I’m not – it’s all him. Thought I’d clarify! Yeah who knows. I love amazon as a customer as well. Ive actually listed my item on ebay already also but I havent even received one sale. I really need to figure out how to get rid of my remaining products. Setting up my own website might work but it would probably take forever to get rid of the qty. I am very disappointed to hear about Amazon giving you the shaft. If you decide not to proceed can you do an article detailing the product you had manufactured? I would love to hear more details about the shut down, why you chose the product you sold and any other details you have left out. Yes I dont see why I would not be able to reveal the product once I am done with it. Keep an eye out. Since you’re married now, are you & wife planning to buy any properties using your joint incomes (i.e., both names on the deed) and/or just her name? I know you have a post on how to get a bunch of personal mortgage loans from the bank, but surely they’ll cut you off from more loans at some point? We have a SFH (which we’ll rent once we’re finished living in it) and a duplex, which are under both our names. But we’re thinking about putting the next property just under Mike’s name so we can get a few houses under my name once my salary increases. What are your thoughts on this? And, more generally, how are you and the new wife handling investments and finances? Best of luck, and I look forward to hearing your thoughts on money & matrimony! Well we are in a unique situation because since we moved to Indy, my wife no longer has to work. So she doesnt have any income anymore. She is concentrating on a food blog she recently started and will try and eventually try and make income that way. But to answer your question, yes I would definitely be using her name to buy properties and accumulate more mortgages. That is a great strategy as long as the deal is right of course. You could get 10 in your name and 10 in his name. As for finances in general, she really leaves it up to me to handle it all. Personal finance and real estate investing was not something she was aware of when I met her and I have been trying to instill it in her brain for years now. She trusts me to make all the right decisions for investing purposes. Nice post and congrats on the great month and year! Sorry to hear about your Amazon project going south. Hopefully you are able to move your remaining inventory on Ebay if Amazon doesn’t work out. Does having all those rentals in different states make you nervous? One of my rentals is an hour away from me and often weighs on my mind. I even have a property manager for that one. Do you ever have your property manager send you pictures of the property for peace of mind? Thanks Blake, ebay doesnt seem to be working out for me yet but I have only just listed my product on ebay a few days ago. I dont get nervous at all having rentals in different states. I have full confidence in my property manager and am making enough cash flow on each one to keep me very satisfied. I do manage one out of state in texas on my own but my tenants are super awesome and I trust them. I have not ever had a PM send me a pictures but its not a bad idea and Im sure they would do that no problem if I wanted. Crazy question… no mortgage on property 7 and 8? Also, stinks to hear about Amazon. Love following blog, though I rarely post on blogs. Keep up the great work! Ha! Not a crazy question at all. Yep, I have no mortgage on properties 7 and 8. When I left Austin, I sold my primary home and made over 130k profit. I used that money to purchase rentals 7 and 8. Wow that is rough about Amazon. It is hard to tell sometimes how frequent “worst case scenarios” happen. Obviously it was possible, but who would have thought it would happen to you on your first product? If you don’t end up continuing with Amazon, I would think the time invested could have been spent on something like Uber driving with better returns. But of course you learned a lot out of it. Yeah it really is a shame. Haha yeah its probably true I could have made more money driving uber but I really like the idea of making money in the comfort of my own home and just having internet and researching skills. I did learn a lot from it and im not letting it bring me down or anything. You live, you learn! Hey congrats on the big spike in Net worth, it is amazing how things can change quickly. I increased my net worth as well in 2016 as the markets are up and I bought assets. Hopefully 2017 will bring more cash flow our way. Thanks EL! Congrats on your 2016 as well. Lets make some money in 2017!! You had an incredible year! It’s a bummer that Amazon jerked you around like that. Do they do this because they want to earn the profits themselves? Seems strange to an outsider. Who knows!! It may have been a competitor trying to sabotage me. Guess ill never really know for sure. Great job on acquiring all those assets. If you don’t mind my asking, how did you locate investment properties for less than 100,000?